NASA'sprimary concerns over a Hubble-bound shuttle servicing mission revolve around astronautsafety. Since the lossof Columbia and its seven-astronaut crew, NASA has spent enormous efforts andfunds to address the tragedy's root cause - heatshield damage from external tank foam debris- and demonstrate shuttle inspectionand repairtechniques. Unlike therest of NASA's 15 remaining shuttle flights, which allow astronauts to takerefuge aboard the InternationalSpace Station (ISS) if their orbiter is too damaged to land safely, a Hubble-bound crew has no such safetynet. The telescope flies in a higher orbit, and at a different inclination tothe Earth's equator, than the ISS, making it difficult to reach the station. But NASAhas developed some safety measures to reduce general shuttle flight risks andallow a specific, Hubble-related orbiter repairs. STS-121 spacewalkersMichaelFossum and PiersSellers found that a 100-foot (30-meter) robotic arm combination is apparentlystable enough to serve as a platform for shuttle heat shield repairs. Thetool would allow basic fixes to be performed away from the ISS. "It givesus a really high confidence that we can use this for repair," Discovery'sSTS-121 lead shuttle flight director Tony Ceccacci, tapped to lead a Hubbleshuttle mission if approved, told SPACE.com. "So it's one of thestepping stones to get there." The missionwas a shot in the arm for Hubble scientists who hope that shuttle flights willbe deemed safe enough for one last visit to their orbital telescope. 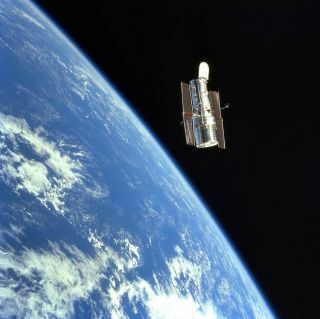 "We'regreatly encouraged," Preston Burch, Hubble program manager at NASA's GoddardSpace Flight Center, told SPACE.com. "People aren't running around herewith their hands in the air, screaming for joy. But this is certainly a verypositive development." Burch saidno less than five spacewalks will be required to put Hubble on a science pathwell into the next decade. After 16 years and thousands of hours observing theuniverse, the space telescope is showing its age. "Theseinstruments and all the rest of the equipment don't last forever," Burch said. "Hubble'sjust like your automobile. You've got to take it into the shop once in a whileand take care of it." The delivery of the new Wide Field Camera-3 to enhance Hubble's all-seeing eye. Replacing the telescope's 16-year-old batteries, a broken fine guidance sensor, and some thermal insulation. An overhaul of the telescope's six-gyroscope attitude control system (two are now in operation, with two spares and two broken units). A first-ever orbital repair of Hubble's Space Telescope Imaging Spectrograph (STIS). Never designed for repair on Earth let alone in space, the fix requires new tools to remove 111 small screws and replace a broken control board. Left alone,Hubble could pump out science through 2009 and, with some clever engineering,maintain basic operations through 2011, Burch said. But one last servicingmission will add five good years onto the space telescope's lifetime, he added. "There'sstill a tremendous amount of science that can come from it," Burch said, addingthat the first bits of new Hubble hardware could be sent to NASA's KennedySpace Center launch site in August 2007. "The telescope today is a far morecapable and reliable telescope than when it was launched." At aCapitol Hill luncheon earlier this month, Griffin assured that no Hubbledecision will be made until after NASA's STS-115 astronauts complete theirmission. "If welearn nothing from Columbia but one thing we ought to understand [that the] peoplewho get on these birds and execute these missions in pursuit of what I believeto be a noble enterprise deserve our attention and respect while they are doingit," Griffin said. Space NewsStaff Writer Brian Berger contributed to this story from Washington D.C.